My friends EE and BR were telling me about a great bakery they stumbled upon outside of Bellingham – actually in Bow, if you happen to know where that is. The bakery is the Breadfarm and after taking a look at their site I knew it would be a place I’d want to check out. Well, I hadn’t had a chance to do that yet but in the meantime EE and BR brought me a gorgeous loaf of Pan d’Oro from the bakery! 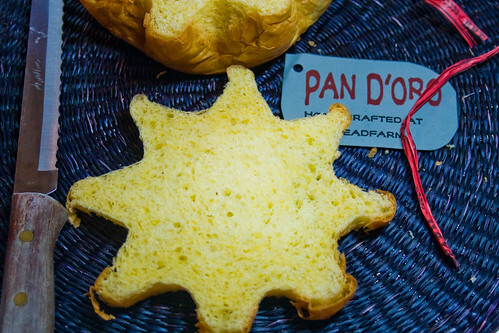 Pan d’Oro is a special Italian bread made during the holidays. It’s baked in a star-shaped mold and is meant to resemble a Christmas tree. You slice it cross-wise so that the slices are star shaped. This is a rich, eggy and slightly sweet bread. It is delicious just sliced and eaten! But it is often used more as a dessert – topped with fruit and whipped cream or creme fraiche or marscapone or drizzled with chocolate – you get the idea. But I’ve been enjoying my loaf just plain. Perfect for breakfast with a cup of tea, or as a little afternoon treat. I may try topping it with preserves of some sort. I think apricot – golden jam on golden bread! What could be better? :-) Was there ever a doubt, really?